Research Projects – European Bioplastics e.V. The biopolymer and bioplastics industry is a key driver of innovation in the bid to transform Europe’s economy into a more sustainable, circular, and resource-efficient bioeconomy. Public and private schemes are funding the research and development efforts that are necessary to enhance our knowledge of tomorrow’s sustainable solutions, improve our ability to produce more efficiently and consume more sustainably, and enable us to effect tangible change. European Bioplastics (EUBP) is committed to supporting research and innovation efforts and currently serves on the Advisory Boards of six on-going EU and national research projects. As an association, we also encourage our member organisations to join in on selected programmes that are pushing innovation in fields that are related to their business or research focus in order to strengthen the link between academia and industry and provide opportunities for the commercialisation of research outcomes. At EUBP’s annual European Bioplastics Conference, we regularly provide an opportunity for research projects to present their findings to a highly targeted and relevant audience, and we disseminate project-based bioplastic innovation achievements across our network on a regular basis. As a member of the PolyBioSkin Horizon 2020 project consortium, EUBP is currently working together with academic and industry partners in an effort to develop solutions for the bio-based economy of the future. Project enquiries: If you would like to find out more about our project-based activities, or if you would like to partner up with European Bioplastics or its members in research project initiatives, please do not hesitate to contact us or complete and return this form. PolyBioSkin is a three-year Research and Innovation Action that has received funding from the Bio-based Industries Joint Undertaking under the European Union’s Horizon 2020 research and innovation programme under grant agreement No. 745839. Focussing on skin-contact applications, the project utilises the beneficial properties of biopolymers and innovative engineering and nano technologies to create performance and sustainability-improved bio-based biodegradable mass-market products in the biomedical, hygiene, and cosmetic sectors. 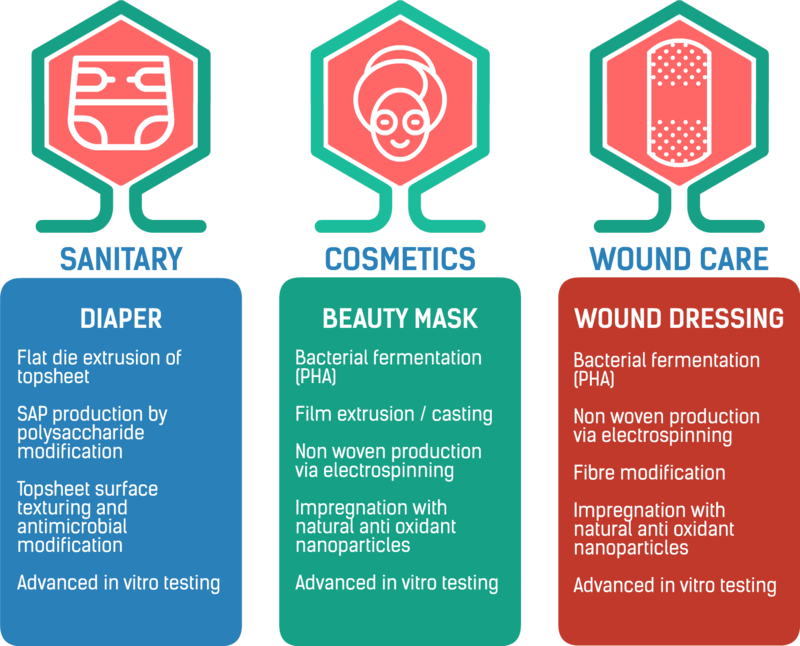 The aim is to engineer femcare sanitary pads and baby diapers, wound dressing, and facial beauty mask prototypes that are 90% or more bio-based, biodegradable in so far as they meet the requirements of the standard EN 13432, and exhibit similar or superior performance to comparable conventional products that are neither bio-based nor biodegradable. The administrative coordinator of PolyBioSkin is Barcelona-based advanced engineering and research company IRIS, who have a wealth of experience and expertise through their leadership in numerous H2020 and other projects. The University of Pisa’s School of Engineering is the scientific coordinator of the project. Overall the consortium is composed of an even mixture of innovative SME industrial partners and hand-selected universities with a strong research focus in the area of biomaterials innovation and processing. European Bioplastics supports the consortium primarily in the area of communication and dissemination, but also brings their expertise and networks to bear on the project in other fields, such as standardisation, exploitation, and regulatory and policy framework assessments. For detailed information, please go to http://polybioskin.eu. Sustainable Transition Assessment and Research of Bio-based Products – STAR-ProBio – is a multi-actor collaborative Research and Innovation Action (RIA) coordinated by Unitelma Sapienza University that includes 15 partners from 11 European countries. It has received funding from the European Union’s Horizon 2020 research and innovation programme under grant agreement no. 727740. The overall objective of the project is to promote a more efficient and harmonized policy and regulatory framework for the market-pull of bio-based products. This will be achieved by developing a fit-for-purpose sustainability scheme, including standards, labels, and certifications. An integral part of STAR-ProBio is the adoption of life-cycle methodologies to measure environmental, techno-economic, and social impacts, and comprehensively assess the roll-out of bio-based products. The analysis of selected case studies on construction materials, bio-based polymers, and fine chemicals will ensure that the approach is not too broad and theoretic, allowing the benchmarking against non-bio-based products. European Bioplastics is a member of the Advisory Board of STAR-ProBio and serves on expert panels support the project’s activities. To find out more about STAR-ProBio please visit http://www.star-probio.eu. Roadmap for the Chemical Industry in Europe towards a Bioeconomy – RoadToBio – has received funding from the Bio-Based Industries Joint Undertaking under the European Union’s Horizon 2020 research and innovation programme under grant agreement No. 745623. The project will deliver a roadmap that will specify the benefits for the chemical industry along the path towards a bioeconomy to meet the societal needs in 2030. The roadmap will contain two main components: Firstly, an analysis of the most promising opportunities for the chemical industry to increase its bio-based portfolio, as well as the technological and commercial barriers and the hurdles in regulations and acceptance by society, governing bodies and the industry itself. Secondly, a strategy, action plan, and engagement guide to overcome the existing and anticipated barriers and hurdles as mentioned above. Furthermore it will bring together different parts of chemical industry, society, and governing bodies, to start a dialogue and to create a platform where this action plan can unfold its full potential, in order to help meet the very ambitious targets of the BIC for 2030. European Bioplastics support the project as part of the Advisory Board, and you can find out more about the project on https://www.roadtobio.eu/#. RefuCoat is an EU-funded project (receiving funding from the Bio-Based Industries Joint Undertaking under the European Union’s Horizon 2020 Research and Innovation programme under grant agreement 745791) aiming to develop fully-recyclable food packaging with enhanced gas barrier properties and new functionalities using high performance coatings. Active coatings will be used in films and trays as an alternative to current metallised and modified atmospheric packaging (MAP) to avoid the use of non-renewable materials in packaging that currently leads to complex and expensive recycling steps. European Bioplastics is pleased to serve on the Advisory Board of this very promising project. You can find out more about RefuCoat on https://www.refucoat.eu. BioCannDo is an awareness and discourse project that aims to bridge awareness gaps, and inform about the potential and long-term benefits of a vibrant bioeconomy sector to the wider public. It aims to show to the public that the bio-based economy offers something desirable, with new products, functionalities and day-to-day applications. In order to do that, BioCannDo is developing multi-stakeholder key messages for communicating functionality and sustainability aspects of bio-based products with the broader public. The project will also aim to engage a European stakeholder network in a joint communication undertaking, and to create synergies for existing materials and develop missing communication formats and educational material to communicate topics of the bioeconomy and bio-based products to the European citizens. BioCannDo receives funding by the Bio Based Industries Joint Undertaking under the EU’s Horizon 2020 research and innovation programme, grant agreement No. 720732. European Bioplastics supports the project as a member of the project’s Advisory Board. You can find out more on https://www.allthings.bio/about/. The aim of this study is to develop a roadmap that provides recommendations for action and future research needs in order to achieve a significant increase in the production of bio-based plastics in the EU by 2050. Funded by the Austrian Research Promotion Agency (Österreichische Forschungsförderungsgesellschaft, project ID 858659), the project is conducted by the Environment Agency Austria (Umweltbundesamt, coordinator) and alchemia-nova GmbH in Austria. While it focuses on the Austrian market and chemical industry, it has a strategic European focus and agenda in support of the transition to a bio-based, circular bioeconomy in the EU as a whole. In 2018, the Bioplastics Roadmap Austria 2050 is expected as a summary report of the analyses and findings of several expert consultations and the recommendations drawn from them. European Bioplastics is supporting this process by offering their views and expertise in in the consultation workshops and by commenting the Roadmap drafts. To find out more, please visit http://www.alchemia-nova.net/en/projects/bioplastics-roadmap/. The Sustainable Plastics and Transition Pathways – STEPS – project responds to the Swedish Foundation for Strategic Environmental Research’s (MISTRA) call for proposals on the subject of “Plastics in a Sustainable Society”. Guided by a vision of a future society in which plastics are sustainably produced, used, and recycled, STEPS wants to facilitate this transition by sharing innovation, knowledge, and research findings between academia and industry. The project has a very strong research agenda that is implemented by its three academic partners and no less than 19 industry partners, including the likes of IKEA, Sekab, Perstorp, and Clariant, and it is supported by the Region of Skåne in the South of Sweden where the University of Lund as coordinator of the project is located. STEPS searches sustainable solutions throughout the value chain from renewable feedstock, conversion, and design, to post-consumer plastic waste handling. The concept is to design sustainable plastics with desired material properties and life cycle my matching suitable carbon-neutral building blocks. The key focus is on polyesters, a key group of plastic materials found in vast quantities in a huge variety of applications. The targeted applications for the plastics developed in STEPS are packaging, textiles, coatings, and durable products. Among the key attributes of the polyesters developed in STEPS are improved barrier properties and thermal stability, recyclability and/or biodegradability. Only renewable feedstocks, including surplus biomass streams and atmospheric carbon dioxide, will be considered in the production of the polyester building blocks, and feedstock security and clean and cost-efficient processing technologies are given key importance. STEPS also aspires to assess potential transition pathways to develop research-based advice on policy and industrial strategies for sustainability in the longer term. Government and policy implications for a circular plastics economy are addressed, including social dimensions and the roles and responsibility of key actors. European Bioplastics, together with the Swedish Standards Institute and the Danish Polymer Centre, serves on the Advisory Board of the project. To find out more, please visit http://sustainable-steps.se. Funded by the German Federal Ministry of Education and Research (BMBF), the BiNa project enables a science-based examination of the current status of bioplastics with regard to all aspects of the sustainable economy. A freely accessible research platform for the establishment of bioplastics as a key part of the green economy in Germany is set up, with the aim to make the discussion about biomaterials less emotional and more fact and evidence-based, and thus support informed decision-making in connection with the transition to bioplastics and a more sustainable economy in general. The work is conducted in a consortium with broad expertise and focuses on the aspects of ecological and socio-economic sustainability of bioplastics as well as opportunities and obstacles for the communication and commercialisation of these materials. Within the framework of this research platform, a strong focus is on the close exchange with industry, science, the general public and politics, as well as to increasing the level of information available for the different stakeholder groups for bioplastics. European Bioplastics is proud to be part of this project as an active member of the Advisory Board together with WWF. For more information about this project, please visit https://www.ifbb.wp.hs-hannover.de/bina/index.php/home.html.